In early 1916,whilst the Australian Light Horse, were re forming after the Defence of Anzac, Turkish forces in the Sinai were menacing the Suez Canal and the British Protectorate of Egypt. Units in Egypt were used to patrol the Suez Canal, eastern Egypt and Western Sinai. Later in 1916, they pushed into Sinai in concert with the re-formed Gallipoli veterans and blunted the Turkish advance. They then pushed forward into Palestine in 1917, successfully defending Egypt. Australian Light Horse reinforcements arriving in Egypt were in some cases posted to the Imperial Camel Corps. The Corps was formed to make use of the Camel's particular desert attributes. Soldiers mounted on animals capable of bearing heavy loads, and lasting many days without water were seen as useful adjuncts to those mounted on horses. The Camel Corps were trained as light horse, or mounted infantry. The camel whilst having a fair turn of speed when required, lacked the agility of a horse in close combat. 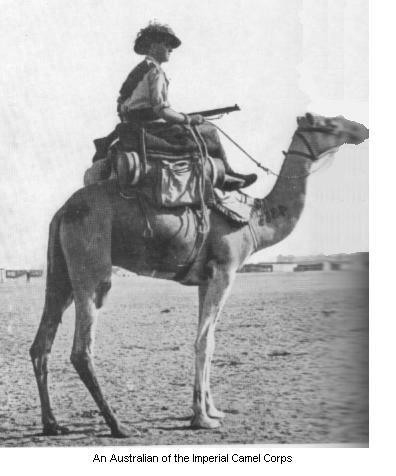 In February and March 1915 the camel brigade patrolled the edge of the desert and the agricultural lands of the Nile Valley to stop all communication between the Senussi a desert people, and the population of the Nile. There was a danger of the Senussi making raids. There were also political reasons for the presence of Allied troops in these parts, nationalism being very strong among the wealthy Egyptian Pashas who probably saw little difference between being under British or Turkish "Protection". In early 1916 it was decided to push across the barren, waterless desert occupied by the Senussi, and fortify oases. For this purpose block-houses, much after the style of those used in the Boer War, were erected. Thousands of camels were in use, the work of erecting the blockhouses being carried out by the Egyptian Labour Corps. Soon after the Camel Brigade were required for another operation word having been received of the Turkish attack on the outposts on the Sinai Peninsula. This led to the successful defence at Rumani, and the other battles that retained Egypt for the British.